If you need assistance with your cleaning process or require professional property restoration in Indio, call Daniel's DKI at (760) 320-2128. How can you expect to have a successful de-cluttering process if you aren't even aware of the things you have in your house? As you may be aware, people love to accumulate things over the years. In the end, they have a house filled with stuff that they don't even remember or know about. For this reason, the first step in said de-cluttering process, is to do a recon job. 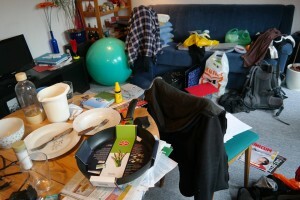 To that end, you should inspect every item, thing, belonging, and other that you may have at home. To make that happen, you need to look in every room, in every drawer, closet, cabinet, shelf, the garage, and other storage space you may have. This can be a daunting task, which is why it's recommended that you ask for help from other people. For example, your family members or a close friend should be able to help out with this. As you're doing the recon job, it's recommended that you have a notebook and pen handy. This way, you'll be able to note down if there's anything you have to fix, restock, and more. After you have a better idea of what you have, the next step is to go through a bit of an introspection. Said introspection is meant to help you decide what you keep and what you should get rid of. To help you make those decisions, you will need to ask and answer questions about every single item that you went through. A few examples of those questions can be: do I need this in my life, does this thing provide joy for me, has it expired, do I wear this regularly, when was the last time I used this, does this function as expected. These and other similar questions would I buy it again if I saw it in the store, among other similar questions. As with the previous step, it is strongly suggested that you have other people help you through this. Someone that isn't as attached to your belongings as you are, will be more level-headed and will help you move the process along. Since you already know what you have and whether you want it in your house or not, it's time to decide what you will do with it. To make this process more organized, it's recommended that you put everything your belongings into 5 different categories. In the first pile of things, you should include everything you want and need in your home. These are the items that you know you'll use and like in your house. You can them create a separate pile for all of that things that you want/need in your house, but that need to be fixed before you can make use of them again (for instance, a coat with a broken zipper). However, make it a point to repair them so they don't clutter your home again. In a third section you can gather everything that you want to donate to charity, or that you think that family/friends could benefit from. These are items that are in good shape but that you no longer have use/want for. If you deem it necessary, you could also create another group where you put together everything that you could sell. For example, you can organize a yard sale with those items to cover some of your expenses. Finally, you should create a pile for the things that should go in the trash. These are the things that have expired, are damaged beyond repaired, or that simply can't be salvaged. The last thing you need to do after you've successfully gotten rid of a considerable chunk of your belongings, is to reorganize your home effectively. Before you start putting things in their new place, you should first ensure that every surface in your place is completely clean. Wipe everything down (shelves, cabinets, and more), so your home can be squeaky clean. Then, create an organization system, so everything can be in a place that makes sense and where you will be able to find it easily. Call Daniel's DKI at (760) 320-2128 to get a free estimate on professional property restoration in Indio.